Lennie Niehaus wrote a series of terrific arrangements for the Stan Kenton Orchestra (this was recorded on the "Stage Door Swings" CD). As recorded by the Stan Kenton Orchestra on Adventures In Standards, this is a medium, swing chart on a great tune. This was recorded by the Stan Kenton Orchestra on Stage Door Swings, and it is one of Lennie's wonderful charts on a great Broadway standard tune. As recorded by the Stan Kenton Orchestra on Adventures In Standards, this is a medium-swing chart on a great tune. As performed by the Stan Kenton Orchestra, here is one of the hippest charts from the Kenton book. When Lennie arranged for the Stan Kenton Orchestra, he created the most beautiful big band dance book ever written. As recorded by the Stan Kenton Orchestra and Jean Turner, this is a superb Ellington ballad that will make you want to hear it over and over again. This is a beautiful, lush, straight-eighth ballad on the popular Cole Porter tune "Easy To Love. A magnificent alto saxophone feature. As recorded by the Stan Kenton Orchestra on Stage Door Swings, this is a lovely ballad scored in the incomparable Kenton style. This is one of the many wonderful charts arranged by Lennie for the Stan Kenton Orchestra. This is another of the many wonderful charts arranged by Lennie Niehaus for the Stan Kenton Orchestra. When Lennie arranged for the Stan Kenton Orchestra, he was able to capture the Kenton sound without a lot of high-range problems or difficult concerns for the players. Here is a wonderful vocal chart by Lennie on this unforgettable standard. A lovely Broadway tune as scored for Kenton's dance book. As recorded by the Stan Kenton Orchestra on "Adventures In Standards" CD, this is a wonderful, swinging chart on a great tune. Here is another terrific chart as recorded by the Stan Kenton Orchestra on Adventures In Standards. As arranged for and performed by the Stan Kenton Orchestra, this is a wonderful setting that features the saxophone section and solos for trumpet and trombone. Not every Niehaus dance chart was recorded by the Kenton Band, but this chart was played all the time by the band. This is another of the many wonderful charts arranged by Niehaus for the Stan Kenton Orchestra. Lennie wrote a magnificent dance book for Stan in the early '60's. This is another of the many wonderful charts arranged by Lennie for the Stan Kenton Orchestra. This is another of the many wonderful charts arranged by Niehaus for the Stan Kenton Orchestra. 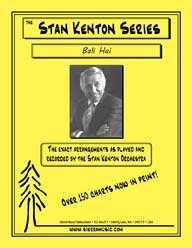 The album Stage Door Swings, by the Stan Kenton Band, was one of the most popular recordings done by Kenton. This is one of the many wonderful charts arranged by Lennie for the Stan Kenton Orchestra. This was the first chart arranged by Lennie to be recorded by Stan's band. This is another one of those absolutely wonderful charts that Lennie did for Stan Kenton for what was known as the dance book. Arranged by Lennie Niehaus and performed by the Stan Kenton Orchestra, this great medium-swing chart has outstanding ensemble writing. This is one of those marvelous "dance" charts that Lennie Niehaus wrote for the Stan Kenton Orchestra. As recorded by the Stan Kenton Orchestra on Stage Door Swings, this medium-up swing chart comes roaring out of the chute with a brass pop and leads into the piano stating the melody. Lennie Niehaus wrote a series of terrific arrangements for the Stan Kenton Orchestra (this was recorded on the "Stage Door Swings" CD).